When I'm talking about a 100% bujo newbie, I mean someone that hasn't even started a bullet journal yet. Maybe you happen to know someone that's been thinking about making one, or maybe you're a bullet journalist yourself and want to get someone else to become one, too. Whatever the circumstances, this type of bullet journaler truly only needs two things: a notebook and a writing utensil, and they don't have to be anything fancy. However, getting snazzy supplies is always really fun and a great motivator! For someone that has zero idea where to start with this whole "bullet journal" thing, I suggest getting them a Leuchtturm dot grid notebook in A5 and a pack of Staedtler Triplus Fineliners. The Leuchtturm notebook is a cult classic in the bujo community due to its versatility, and the Staedtlers are great pens to add color with. These two products are a great pair to get any sort of person started with bullet journaling. If you want some different options for what a beginner might want, I've covered many more common bullet journal supplies in another post. Also, I've also written a post about the "Kara Kit," which is all about the basic supplies the ever popular Kara Benz of Boho Berry (used to) use. This category is for the people that probably have been bullet journaling for only a relatively short amount of time, so they're still figuring out their system. For these people, "experimentation" is a pretty good word to describe their system; they would probably enjoy packs of products with lots of variety. Fortunately, JetPens carries a lot of different sample packs of pens. For the sake of practicality (in the eyes of a bullet journalist), there are two that stand out: the black gel pen sampler and the drawing pen (fineliner/felt tip) sampler. They both include a wide variety of different and very high quality pens in different tip sizes, so the gift receiver will get to try out a bunch of different pens. Additionally, I think a beginner bullet journaler would enjoy a notebook sampler package set. This pack from Goulet Pens includes six different mini notebooks so he or she could try out paper from several different brands (and yes, paper does vary from brand to brand and even within a brand itself). And lastly, I think someone at this stage of bullet journaling would want to branch out and try a fountain pen; the Pilot Metropolitan is a very highly suggested pen for someone that is completely new with fountain pens. By experienced bullet journalists, I'm talking about people that probably have been using a bujo for a while and are pretty confident and steadfast with a lot of aspects of their system. Because of this, I don't suggest getting them a notebook (unless you know buy one that they have specifically requested) because the notebook that someone uses as their bullet journal is a very personal matter; most seasoned bullet journalers have a preference for a certain notebook. For people that fit in this category, I suggest pens. After all, the stationery addiction that develops after bullet journaling for a while would not object to this, and the bullet journaler him/herself would be able to get lots of use out of your present! 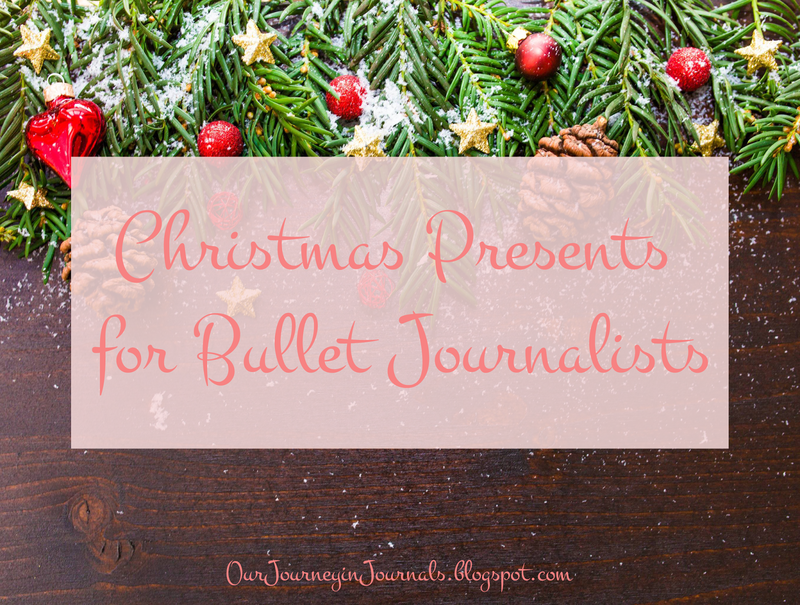 I myself, as an "experienced" bullet journalist, would most prefer pens for Christmas (when it comes to the topic of bujo-appropriate items at least). An experienced bullet journalist would enjoy receiving a fountain pen (again, the Pilot Metropolitan is a good first FP) or ink samples if they already have a fountain pen and are somewhat experienced with them. Even if they already own the Pilot Metro, it's a good enough pen that probably no one would complain about having two. I know that a lot of people (including myself) like using gel pens for most of their writing. For everyday writing, the Pilot Juice Gel Pen (which is my personal favorite gel pen) and the Zebra Sarasa Push Clip Gel Pen are both good pens, but they are uncommon enough that the gift receiver probably would not own them yet. For special effect/art gel pens, I cannot more highly suggest Sakura Gelly Rolls. They come in 3D ink, metallic ink, glittery ink, neon ink, and more; they are also super high quality. Yes, you can get those "100 gel pens for $10" packs with different types of ink from Costco or something, but if you can, getting more expensive gel pens really is worth it. Also, if you know of a gel pen that they absolutely swear by, they would definitely appreciate getting a pack of that gel pen in black or a pack of ink cartridges/refills for that pen in blank (if they're available). I know that a lot of people in the bullet journal community already have the Tombow Dual Brush Pens, but since they come in so many different colors, you can probably find a pack of them that the person you're shopping for doesn't have yet. However, most bullet journalists don't have a lot - if any - highlighters. I suggest the Zebra Mildliners since they're double-ended and come in 3 different packs (15 colors in total) in the US. Along with just normal highlighting, I also like to use highlighters kind of like markers by using them to add color in my spreads. These are gifts that any sort of bullet journaler - despite the skill level they belong to - would be happy with receiving as a present. First up is washi tape, which is decorative Japanese paper tape (think fancier and cuter masking tape). Washi tape is absolutely amazing, and you can generally find them for $1 per roll. You can also buy them all over the place (I've personally gotten rolls from Amazon, Taobao, Meijers, and Michael's). There is virtually an infinite amount of designs that one can buy, so there are definitely patterns out there that would the suit the fancy of the present receiver. A 6" ruler (or a 15 cm ruler for you non-Americans) would be very helpful for any bullet journalist that likes to do things while on the go. They're very convenient to use as a straight edge when making spreads, and they can also fit inside the back pocket of an A5 notebook. All of this stationery can really add up. So, some sort of stationery desk storage/organizer or pencil case would be really useful for a bullet journalist. In my opinion, mini drawers (like this) would work the best; you can find some good ones if you search for "jewelry organizer" online. As for pencil/pen cases, there are a lot of nice ones on JetPens. I suggest getting one with a large capacity (like 20+ pen capacity) so that the bullet journaler can fit a lot. Those were some presents that a bullet journalist would enjoy receiving for Christmas. I hope that this post gave you some good ideas and helped you with your Christmas gift shopping! If you use a bullet journal, what do you want for Christmas? Tell me in a comment down below!